Freor is celebrating its 15th anniversary! Today, Freor is celebrating its 15th anniversary! Brief history – the company was founded in 2000 to carry out repairs of second-hand refrigeration equipment, managed by engineer and businessman Rytis Bernatonis. Five years after its establishment, in 2005 the company manufactured its first commercial refrigerator, developed the Freor trademark. 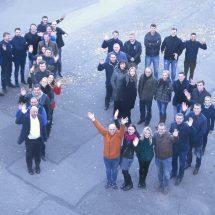 375 employees in Freor Group, who are creating our company’s success through their daily sincere work. We would like to thank all our clients, partners and suppliers for their trust and co-operation!